OpenDataSoft is happy to announce it is offering all students in the Wake Technical Community College Analytics department a free open data portal to help them build hands-on data sharing and analytics skills. Wake Tech is the first and only college in the country to offer an Associate in Applied Science degree in Business Analytics, and OpenDataSoft applauds the college’s role in helping already degreed students make a positive career transition, and in using specially-adapted business analytics content to retrain unemployed and underemployed workers. The program is also a win-win for the community, helping Triangle companies gain a competitive edge by giving them access to a pool of well-trained specialists who can help them grow and manage their businesses. We at OpenDataSoft are really looking forward to seeing the wonderful projects these students will develop using open data and their new open data portals! 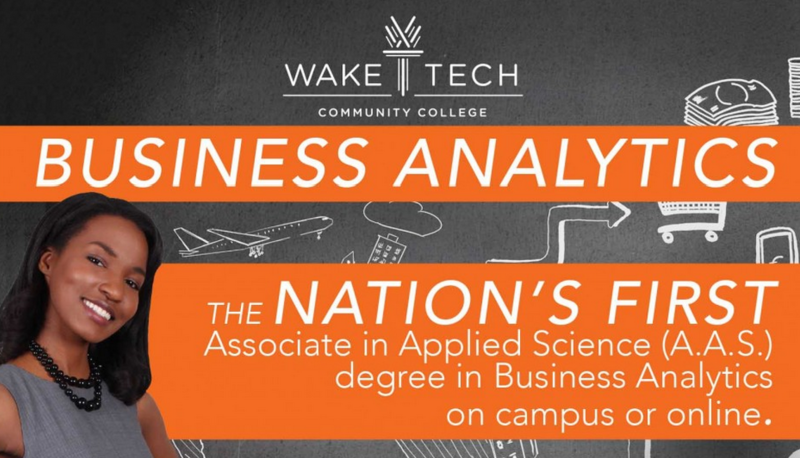 Wake Technical Community College offers the first and only Associate in Applied Science degree in Business Analytics in the country. The program provides the knowledge and skills necessary for employment and growth in entry-level business intelligence and analytics professions. The program is fully accredited and offers courses in on-campus, hybrid, and online formats.